Welcome to our new team member: Alexandre Caminada. Alexandre Caminada holds an engineering degree from ESIEA-Paris (1987), a M.Sc. in artificial intelligence from Paris XIII (1987) and a PhD in computer science from University of Montpellier (1993). He joined the National Center for Telecommunications Studies (CNET now Orange Labs) in 1993 to lead a European project and a research unit on mobile network optimization. In 2003, he joined University of Technology Belfort-Montbéliard (UTBM) as a university Professor where he held several responsibilities: head of the optimization research team, director of the training department of computer engineers, then director of the training and pedagogy of the institution. In 2017, he became the director of engineering school Polytech Nice Sophia. 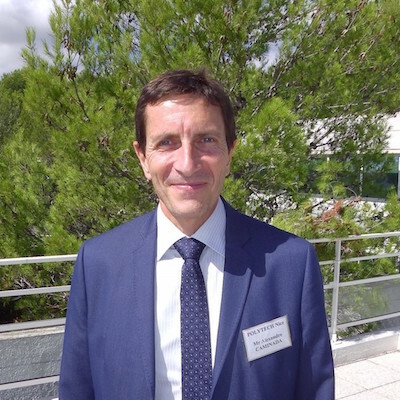 In September 2018 he joined Université Nice – Sophia Antipolis as a university Professor and is now a member of COATI. He has already supervised 22 PhD theses and has published numerous scientific publications (see dblp and google scholar).